The CMS has done away with an Obama-era policy that prohibited providers from using medical students' notes as part of a patient's official medical record. Under the previous administration's policy, teaching physicians had to re-do any notes done by a student from patient examinations. But starting March 5, the physicians only have to verify the information gathered by a student, according to an under-the-radar Feb. 5 notice. Teaching institutions say the change comes just in time as case loads swell and the CMS and other payers expect providers to track increasingly more information about patient care through complex electronic medical systems. "The improvement lies in the fact that we will reduce the duplication of data entry into electronic health records," said Dr. Chris Ghaemmaghami, chief medical officer and emergency room doctor at the University of Virginia Medical Center. "This will allow our physicians to spend more time with the patients and teaching our learners … (which) will actually improve our patients' care and experiences." Patients could also benefit as the new policy will likely strengthen access to care because it addresses a cause of physician burnout. 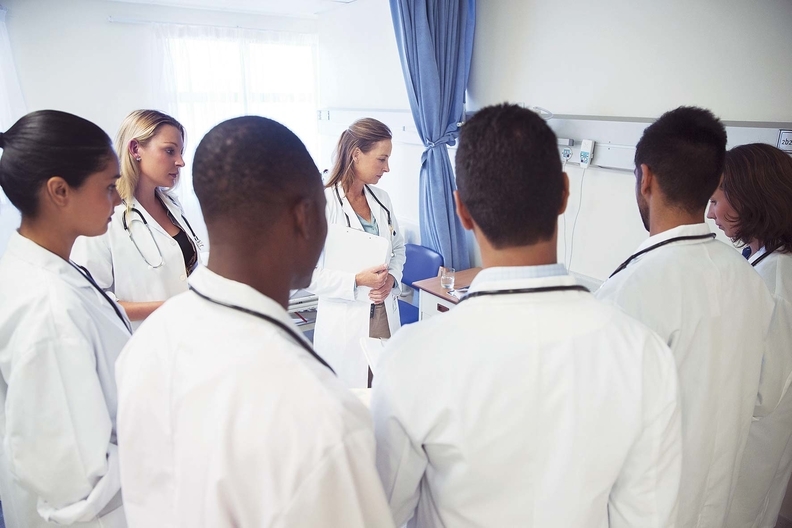 "Physician burnout has increased dramatically since these requirements have been in existence," said Dr. Erica Brownfield, assistant dean of medical education at Emory University School of Medicine. The repeal of the documentation policy means administrative burden will drop substantially as clinicians won't have to spend countless hours redoing a student's work, Brownfield and others said. Around the time the Obama administration prohibited the use of student notes in medical records in 2008, media reports said that CMS officials had grown frustrated that records completed by residents often lacked basic information. However, the policy change ended up have a chilling effect on medical education, according to Dr. Kelly Caverzagie, associate professor of internal medicine at University of Nebraska Medical Center. "Medical students were not allowed to participate in the medical record process at all after that at some institutions, for fear that a physician would end up breaking the rules," Caverzagie said. In other instances, "physicians pressed for time, would choose to do the documentation themselves," added Dr. Donald Brady, professor of medical education & administration at Vanderbilt University Medical Center. These actions negatively impacted medical education. It created situations where medical students were not learning how to properly document medical records, which is a crucial skill since records are reviewed as part of the claims reimbursement process. In addition, when teaching physicians are reviewing medical records done by a student, those meetings often turn into broader lessons about patient care. The new policy does not mean students won't be supervised or that medical errors will suddenly increase, according to Dr. Martin Makary, professor of surgery at Johns Hopkins School of Medicine. Work by medical students will continue to be reviewed by experienced clinicians, who will still perform their own medical exams and make a diagnosis. "Doctor use their clinical judgment to determine which information is reliable and which needs to be verified," Makary said.